It begins the way it always begins, young Master B drags a wood dining chair across the kitchen floor to a small patch of uncluttered counter next to the stove and climbs on top of the chair—his toes dangle off the edge. This act breaks all kinds of no-nos: climbing on the furniture, being next to the stove, access to unsavory items past the “no-reach” zone that include glass baby food jars and scissors. I know what comes next. From the moment that rickety chair starts its journey across the linoleum: Bertram wants to bake. “Bake! Bake! I want to bake!” exclaims the little chef. Is this the result of my major weakness for watching Food Network shows while he was in uteuro? Did he pick up precision tips from Alton Brown and semi-homemade shortcuts from Sandra Lee? Generally, toddlers are not known for their ability to focus. 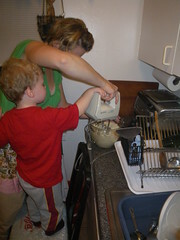 While baking, young Master B will exhibit his most stellar behavior and self-control. An hour can easily pass while Bertram measures each ingredient, mixes, folds, pours, or pounds. Wanting to cultivate his enthusiasm, I just let him do whatever interests him stir, run the beater, break eggs and pour milk into a cup. Indeed, the hardest part of the process is the part where the baker lets the oven do the work. I worry more about him burning himself than any other part of the baking, and I forbid him any access to the oven. I know that I should be MORE concerned about him the potential hazards of whirring electric beaters, tottering on an uneven chair, or stirring over a pot of hot water to make seven-minute frosting. I should be, but strangely I am not. Here's a photo in response to your photo!